A great day for golf. After calling for thunderstorms all day we managed to find a beautiful sunny day in the 70’s to golf in the Nick Janick Allstate Classic. 1st group came in at a record time of 2 hours and 50 minutes with the last group coming in 4 hours 30 minutes. An exceptional timing for tournament golf. After enjoying a nice meal on the patio and the evening coming to an end, the rain began, the thunder boomed and a huge bright rainbow shown across the sky for the drive home. Great way to end the day. Long drive prizes were $50 to Golf Town, congratulations to Nick Janick, Joe Greco & Paul Boycott. Closest to the Pin prizes were $50 to Golf Town, congratulations to Steve Butkovich, Gerry Thibert and Andrew Folkeringa. DALLAS (May 16, 2017) — Omni Hotels & Resorts wants this summer to be all about golf and good friends, so it’s offering great golf packages for groups of “fore” or more at its 11 luxury destinations in the Omni Golf Collection. Beginning today, the “Guys Golf Getaway” package features the full VIP treatment at the Omni golf resort of choice. That means playing in the footsteps of legends when teeing it up at historic tour venues like The Omni Homestead in Virginia, Omni Mt. Washington in New Hampshire, and Omni Bedford Springs in Pennsylvania, as well as iconic courses like Omni Tucson in Arizona or Omni La Costa in Carlsbad. And those are just a few of the great courses in the Omni Golf Collection. The Guys Golf Getaway package includes access to all resort amenities, along with unlimited golf (per person/per night, including arrival/departure days) and an in-room welcome amenity featuring an Omni “Brewski Bucket” full of beer and chef’s selection of appetizers. Every member of the group also gets a $50 golf retail credit, daily breakfast, unlimited use of the resort’s practice facilities, and club storage. Gal golfers and couples’ golf groups are welcome, as well—the more in the group, the merrier (and more competitive) it gets! Package prices start at $275 per person (based on a three night stay) and vary by resort and visit dates. Omni Hotels & Resorts creates genuine, authentic guest experiences at 60 distinct luxury hotels and resorts in leading business gateways and leisure destinations across North America. With more than 20 world-class golf courses and award-winning spa retreats, to dynamic business settings, each Omni showcases the local flavor of the destination while featuring four-diamond services, signature restaurants and unique wellness options. Known for its distinguished, personalized service, Omni leaves a lasting impression with every customer interaction, with a heightened level of recognition and rewards delivered through its Select Guest loyalty program and the company’s “Power of One” associate empowerment program. The brand is frequently recognized by top consumer research organizations and travel publications and was ranked “Highest in Upper-Upscale Segment Guest Satisfaction” in the J.D. Power 2016 North American Hotel Guest Satisfaction Index StudySM. As a founding member of the Global Hotel Alliance (GHA), Omni’s loyalty program is further expanded through the DISCOVERY® loyalty program offering members additional global benefits. Committed to reducing hunger, Omni is on a mission through its Say Goodnight to Hunger initiative to help provide more than 18.2 million meals each year for food banks to feed children, families and seniors in communities in which it operates. To get additional information or book accommodations, visit omnihotels.com or call 1-800-The-Omni. Pawleys Island, S.C. – Golf Digest unveiled its biennial list of America’s 100 Greatest Public Courses in the June issue of the magazine, and a familiar name retained its place among the nation’s elite layouts. Caledonia Golf & Fish Club, Myrtle Beach’s most popular course, was 86th on the prestigious list. The late Mike Strantz’s first solo design, Caledonia has been on seven of the last eight iterations of the Golf Digest list and is a consensus top 100 public layout. The course is No. 29 on Golf Magazine’s list of the Top 100 You Can Play and Golf Channel travel guru Matt Ginella ranked it No. 14 on his list of the nation’s top 50 public courses. 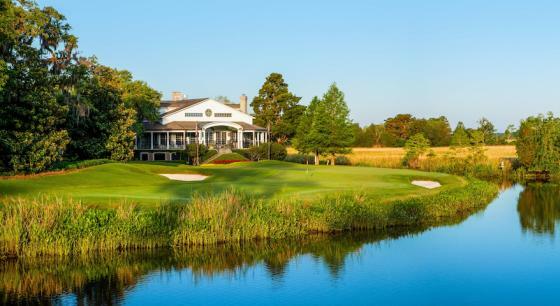 Caledonia, which is equal parts art and architecture, plays through a stunning piece of lowcountry land that was once home to a thriving rice plantation. The live oak trees draped in Spanish moss, the marshy waters of the Waccamaw Neck, and Strantz’s architectural brilliance combined to make Caledonia one of America’s premier public golf experiences. A round at Caledonia concludes at the iconic 18th hole, which requires golfers to carry water on the approach to a green the rests in the shadow of an antebellum clubhouse. A crowd is typically gathered on the clubhouse deck, enjoying the drink of their choice, and providing a gallery at the conclusion of an unforgettable round. In addition to providing a premier golf course, Caledonia continues to deliver tremendous value, particularly when packaged with its sister course, True Blue Golf Club. The Sizzlin’ Summer Special, which can be booked at exclusive rates through Caledonia Golf Vacations, is a 2-night, 3-round deal that includes golf at both True Blue and Caledonia and it starts at $339. Given that True Blue is No 77 on the Golf Magazine list and Ginella ranks it 41st on his list, the Sizzlin’ Summer deal is as full of quality and value as any summer golf package in America. For more information, go to www.CaledoniaGolfandFishClub.com. We couldn’t ask for a more beautiful day for a golf tournament. Monday was exceptional. Playing in threesomes and shot-gun starts has enabled us to play tournament golf in four and a half hours, with our first group coming in at just under four hours. A big thank you to Ambassador for hosting our tournament on short notice. Everyone enjoyed the challenge of this course, designed by world renowned architect Thomas McBroom. Long drive prizes were donated from Supreme Restoration Services, congratulations to James Gendreau, Adrian Roy and Peter Harris. Closest to the Pin prizes were 3 days at Treetops Resort in Gaylord, Michigan for each division, congratulations to Scott Thorpe and Jeremy Flammersfeld. (COVINGTON, GA) – Bridgestone Golf – Innovator and manufacturer of premium golf balls, clubs and accessories – officially releases its ultra-premium TourB Series of drivers, fairway woods, hybrids and irons, now available in limited quantities through select fitting partners around the United States. Locations offering the high-end, Japanese-crafted clubs can be found through the company’s website athttps://bridgestonegolf.com/en-us/where-to-buy/find-a-golf-retailer#/TourB. These Bridgestone Golf authorized fitters work closely with customers to determine the best clubhead / shaft combinations to ensure clubs are built to the exact specifications that will most benefit the user. A variety of the highest-quality components are incorporated into the fitting process, including exotic premium shafts from Mitsubishi Diamana, Fujikura, UST Mamiya and Aldila (estimated added value of more than $300). TourB Series drivers are offered in three unique models, the XD-3, XD-5 and XD-7, featuring a matte finish and adjustable hosel that allows eight face-angle / lie configurations. All come with interchangeable weights (2g, 4g, 6g, 8g, 10g, 12g) to dial-in preferred trajectory and shot shape. Designed with the compact shape preferred by better players, XD-F fairway woods are available in 15* and 18* lofts and the XD-H hybrids are available in 18*, 21* and 24* options. Adding to Bridgestone Golf’s celebrated line of forged irons for low handicappers is the cavity-backed X-CB and traditional X-Blade. Both feature high-quality 1020 forging, 15 premium shaft options and minimal offset for a clean address and excellent workability. Additionally, the two have a forged mass strategically placed behind the impact zone for incredibly solid feel and response. The X-CB is engineered with a wider sole to prevent digging and encourage smooth turf interaction, while the X-Blade has a narrow sole, preferred by many Tour players, to help shape shots of all varieties. (COVINGTON, GA) – Bridgestone Golf – Innovator of premium golf balls, clubs and accessories – is joining forces with the acclaimed IMG Academy to assist in the development of numerous young golfers who attend the school and partake in its popular camps. The new relationship will designate Bridgestone as the Official Golf Ball provider of the Academy. Bridgestone will support IMG’s talented youth by providing award-winning golf balls as well as donating a variety of high-quality clubs and accessories for use by general student and camping populations. The relationship ensures that IMG athletes have access to the best available equipment, while Bridgestone can build brand loyalty by introducing its products to potential long term golfers, many of whom will go on to play at the collegiate and professional levels. IMG Academy has an outstanding reputation for helping young athletes achieve their full potential in a variety of sports, including alumnus Paula Creamer, an LPGA Superstar and Bridgestone Golf ambassador. This announcement marks the latest prominent organization to select Bridgestone as their preferred equipment provider, joining the University of Oklahoma and Vanderbilt University among others. As part of the agreement, Bridgestone receives prominent branding throughout select IMG facilities, including the golf instruction and performance center. Separating Bridgestone from all other ball manufacturers is the company’s unique and proven approach to new product development. It introduced a proprietary Ball Fitting System in 2007 and uses the data gathered to drive research and development. This real-world understanding of player needs has led to numerous technological breakthroughs. More information on the company’s ball, club and accessories offerings are available at www.bridgestonegolf.com. The company’s professional staff features 14-time major winner Tiger Woods, FedExCup champion Brandt Snedeker, Olympics bronze medalist Matt Kuchar, Masters winner Fred Couples, three-time major champion Nick Price, recent PGA Tour winner Hudson Swafford, Bryson DeChambeau, and LPGA Tour stars, Paula Creamer and Karrie Webb. IMG Academy is one of the world’s largest and most advanced multi-sport training and educational institutions. IMG Academy helps countless youth, adult, collegiate and professional athletes reach their full potential in and out of sport by providing world-class teaching and coaching, tailored programs and professional facilities. Based in Bradenton, Florida, IMG Academy also serves as a training and competition venue for amateur and professional teams, a host site for a variety of events, and a hub for sports performance research and innovation. Myrtle Beach, S.C. – Caledonia Golf & Fish Club and True Blue Golf Club, two of America top 100 public courses, are founding partners of The Architect’s Nine, a membership program that provides golfers special access to a collection of the nation’s best layouts. 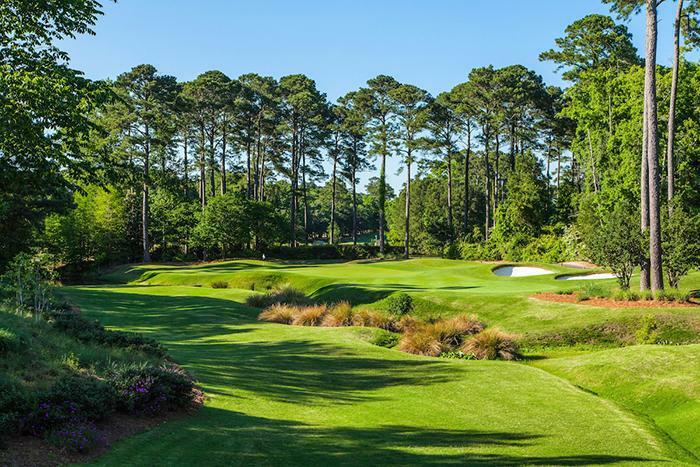 The courses joining Caledonia and True Blue as part of The Architect’s Nine are Tobacco Road, Sweetens Cove, Wine Valley, Wild Horse, Rustic Canyon, Southern Pines and Rackham. Six of the nine courses have earned top 100 honors and there are three Mike Strantz designs, two Donald Ross layouts and a Gil Hanse/Geoff Shackelford course participating in the program. At a rate of $210 per month, paid annually, membership at The Architect’s Nine includes greens fees, a welcome package with tee gifts, 20% discount off rack rate greens fees for guests of members, a nationwide members forum, optional participation in an annual nationwide, season-long competition, and access to members-only merchandise. For more information, interested members of the public should visit www.TheArchitectsNine.com or send a note to MemberServices@TheArchitectsNine.com. The golf course lineup is highlighted by Caledonia, a consensus top 100 public course. The layout, which is equal parts art and architecture, plays through a stunning piece of lowcountry land that was once home to a thriving rice plantation. The live oak trees draped in Spanish moss, the marshy waters of the Waccamaw Neck, and Strantz’s architectural brilliance combine to make Caledonia one of America’s premier public golf experiences. Everything about True Blue is big – the fairways, the greens and most of all, the fun. Strantz used waste bunkers, which frame many of the course’s fairways, to craft a layout that is among the Myrtle Beach area’s most visually stunning. Tobacco Road (Pinehurst, NC) – Designed by Mike Strantz. Golf Course Architecture’s #50 -Top 100 in the world. Golf Digest – #71, Top 100 Public Courses, Golf – #88, Top 100 Public. Golf Magazine – #6, Best in State. Golfweek – #7 Best in State. Sweetens Cove (Greater Chattanooga, TN) – Designed by the firm of King-Collins, Golfweek listed this course at #59 on its Top 100 Modern Courses and named it the #1 Best Public Course in Tennessee. It also earned the highest average rating of all golf courses in TN, AL, MS, and LA in Tom Doak’s Confidential Guide to Golf Courses. Wine Valley (Washington State) – Designed by Dan Hixson. Rated #3, Best in State by Golf Magazine and #3, Best Public Course in the State by Golfweek. Wild Horse (Nebraska) – Designed by Dave Axland and Dan Proctor, Wild Horse was included at #77 on Golf Digest’s Top 100 Public Courses, #89 on Golfweek’s Top 100 Modern Courses and the best public course in the state. Rustic Canyon (Greater Los Angeles, CA) – Designed by Gil Hanse and Geoff Shackelford, this course made Golf Magazine’s Top 100 Public Courses list, was rated the 5th best public course in California by Golfweek and the #11 Best in State by Golf. Southern Pines (Pinehurst, NC) – Designed by Donald Ross and ranked #14 Best in State by Golf, this is where the locals tell you to go play when you visit the cradle of American golf. Rackham (Detroit, MI) – Also designed by Donald Ross. For more information about joining The Architect’s Nine, visit www.TheArchitectsNine.com. Vermont’s ski resorts are home to some of the United States top ranked golf courses. New and experienced golfers alike can find courses for them this summer that offer the perfect balance of challenge and ease, and of course, beautiful mountain views. Find out below what each course has to offer and where visitors can tee up for less this season. The Woodstock Country Club has been named one of the top 100 golf resorts by Golf Magazine. The Robert Trent Jones, Sr. designed golf course at the Woodstock Inn & Resort is an 18-hole masterpiece of terrain features that excite the most seasoned player. Surrounded by breathtaking panoramic views of the Kedron Valley, the full-service club also features a pro shop, practice range, putting green, private lessons, and The Fairway Grill restaurant and bar. The golf course was also the #1 Ranked Golf Course in New England by Gold Advisor and ranked among the Top 25 Friendliest Courses & Top 25 Golf Course Conditions in the U.S. See picture to right. The Sugarbush Resort Golf Club celebrates its 55th anniversary this season. Enjoy midweek golf for just $55 from 7-9 AM or $35 rounds of golf on Thursdays with $35 Thursdays. Other events include Ladies Night and Burger Night on Fridays, Wood Fired Pizza Night on Saturdays, the Brew-Grass Golf Scramble in June, Junior Golf Camps, New England Craft Beer Open and many more. The club has made several improvements this season with a new roof on the clubhouse and over $30,000 in new equipment. Rich in history and scenic beauty, the Stratton Mountain Golf Course offers one of New England’s finest golf experiences with 27 dynamic holes. Designed by noted architect Geoffrey Cornish, the Forest, Lake and Mountain nines offer a rewarding challenge to all who play them. Explore the links with friends with one of many Stratton golf events – including tournaments, demos and a golf exhibition. The Stratton Golf School offers proven programs designed to bring out the best in player’s games for lower scores and more fun on course. Book tee times and memberships online or by calling 1-800-STRATTON. Stowe boasts two of New England’s finest courses, both on and off the mountain. In the heart of it all, visitors will find the Stowe Country Club; with its beautiful undulating fairways and manicured greens with 360-degree views of the surrounding mountains. On the mountain, Stowe Mountain Golf Club is the course that has caught the attention of the golfing world. Stowe Mountain Club, recognized by Golf Magazine as one of the “Top ten new courses in the United States that you can play,” meanders along the slopes of Mount Mansfield and Spruce Peak, reaching an elevation of more than 1,800 feet. The resort course is available to Stowe Mountain Club members, as well as guests of the Stowe Mountain Lodge. Designed to honor the traditions of the game and the rolling Vermont terrain, Okemo Valley Golf Club features wide, emerald fairways framed with rolling fields of golden fescue. Moderate elevation changes, strategically placed hazards and undulating greens, are the hallmarks of this scenic course. Although truly punishing features are few, risk-reward is a course feature that grows with course knowledge. Nearby, in Windham, Tater Hill Golf Club offers plenty of challenge for golfers of all ability levels with a layout that features rolling fairways, spectacular views, cottage-style perennial gardens and the casual ambiance of an old Vermont hill farm. Call (802) 228-1396 for more information. 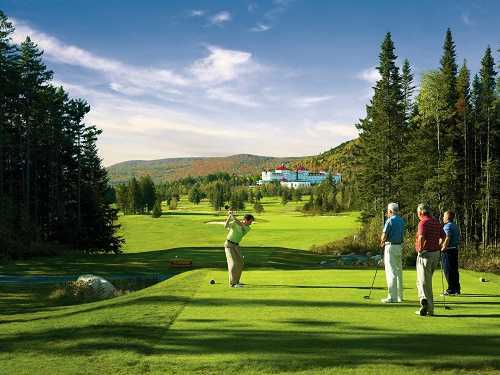 Mount Snow Golf Club, located in the heart of the Green Mountains offers some of the best in mountain golf. Vacation starts the moment visitors pull into bag drop, and lasts to the last sip of their favorite post-round beverage, with beautiful tees, greens, and fairways in between. Located in southern Vermont, and easily accessible from anywhere in New England – the feeling is far away from the everyday. Designed by renowned golf course architect Geoffrey Cornish, the length and mountainous undulations of the course provide a unique challenge, though there is forgiveness to be found in the wide fairways and expansive greens. Killington’s par 72 Championship Golf Course is scheduled to open for the season on May 27, 2017, featuring a brand-new fleet of golf carts plus GolfBoards, back by popular demand. The Killington Golf Course includes a practice facility with a 12,000 square-foot putting green and practice bunker, full-sized pro shop, private lessons, multi-day golf schools and junior specialty experiences. The course features league nights, tournaments all season long and gorgeous views of Killington Resort and the Green Mountains of central Vermont. Golf Season Passes are on sale now and include discount on “Bring a Friend” greens fees, Golf School programs, food at the Clubhouse Bar & Grill and gear at the Pro Shop. •Course Record- 66 set by Bryan Smith, the resort’s former snow reporter. Logan, Utah (May 2, 2017) – Father’s Day is the perfect opportunity to help golfing dads improve their games with two new practice tools: the Swing Coach Club practice club and companion indoor-outdoor SCI-CORE practice golf ball. Swing Coach Club was developed with guidance and collaboration from Dean Reinmuth, a Dad himself as well as both a GOLF Magazine Top 100 Teacher and Golf Digest Top 50 teacher. Reinmuth says that Swing Coach promotes a proper smooth, accelerating swing by removing the “hit impulse” and allowing the golfer to make the correct motion through the impact zone. The SCI-CORE “real feel” practice golf ball is the other half of the Ideal Father’s Day Duo. It is perfect for use with the Swing Coach practice club and also is suited for use with regulation woods and irons. The bright orange ball has a durable non-marking glossy cover, with a traditional dimple pattern to produce accurate flight characteristics. Furthermore, the SCI-CORE ball is designed for extensive use, retains its shape, and will not crack over time. It is so soft that Dad won’t have to replace any broken glass or lamps, and the cover won’t leave any scuff marks. So give Dad the gifts that will make him happy he had you! For additional information about the “Ideal Father’s Day Practice Duo” – the Swing Coach practice club and the SCI-CORE practice golf balls – visit www.swingcoach.com.